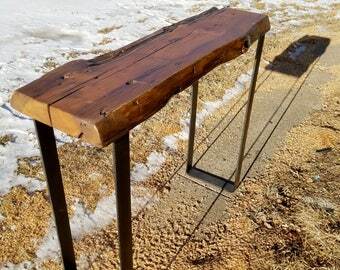 Custom made reclaimed wood console table, entry table Made from authentic, hand-hewn, salvaged wood from barns and cabins in the upper Midwest. Urban farmhouses meets mid century modern. Custom lengths and heights available as well as a choice of pipe or hairpin legs. See details below. 2) Choose your leg style from the drop down menu. Our standard height is 30" tall, dining room table height. I am happy to make them any height you would like. Just make a note in the comment section of your order. There is an extra charge for tables taller than 36". Please inquire if interested. 3) Choose your finish color. Use the personalization field to request your desired finish. I am happy to custom mix a shade to work with your own furnishings, floors, woodwork etc... Please inquire if interested. 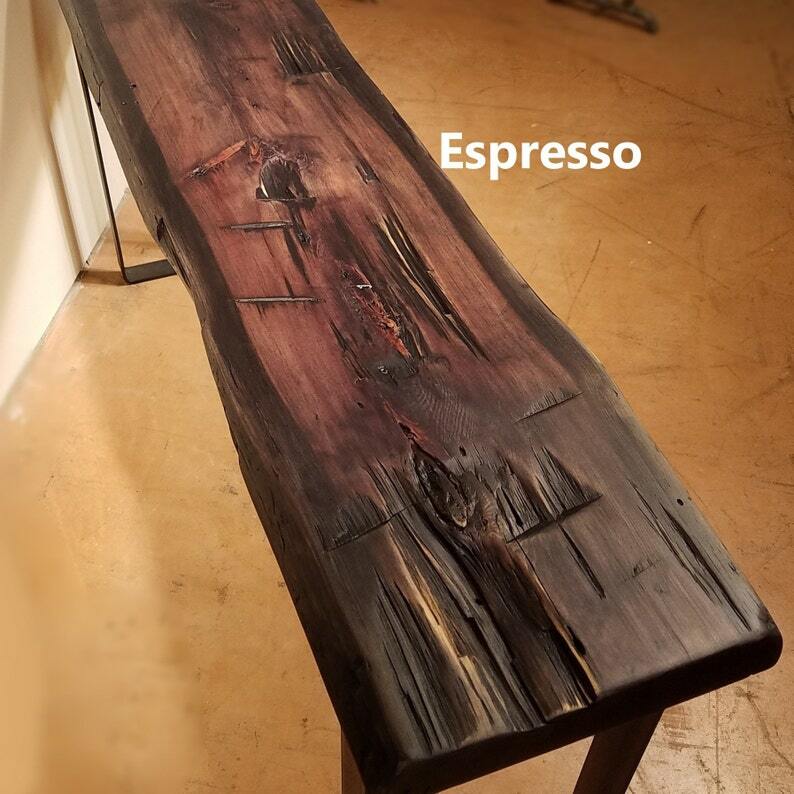 Espresso reminds of dark bitter coffee while revealing the beautiful warmth of old wood. Black On Black for the bold of heart. Pipe Legs - Choose either single or double pipe style. The bottom of all the pipe legs has a cap that will allow you to adjust individual leg length to 1/4" to accommodate uneven floors. The leg standard color is a finish called dark hammered bronze. We also offer Black and antique Gold, make a note when ordering if you would like one of these two. We use a very tough, low VOC, non toxic Enduro-Var that binds the wood fibers. I mix my own dyes and pigments to tint the wood. These darker colors bring out the natural variations of the wood. These pieces of wood are absolutely beautiful! Chris is very responsive, creative and tailors to your needs. This table is the perfect size, I am extremely happy with my piece. Looks absolutely fantastic in my living room. Everyone has commented on it since we got it. Very happy with my purchase. This table is perfect for our small entry.